Are you looking to increase your core strength for cross season but tired of the same old workout? A couple of months ago, solobreak (http://solobreak.blogspot.com/) posted a link to Jospe (http://alexjospe.blogspot.com/2008/10/core-strength.html ) and his core strength training routine. It seems to involve lying down with a big rubber ball and a lot of clenching. I have been planing on starting this routine for a couple of months now but haven't been able to make myself get going with it yet. But, now I've got a better workout and it's guaranteed to keep you from getting lapped by your cross nemeses this season: Go see Motorhead and stand within about 50 feet of the stage. Last night at the House of Blues in Boston I began my new core strength training program and it was incredible. It's the best all over body workout you can get if you survive it. From the time Lemmy Kilmister says "We are Motorhead and we play Rock and Roll" until the house lights come on, you'll be getting pushed and bumped around in a sea of humanity in black t-shirts while your upper body, including those all important core muscles, gets the workout of its life. Motorhead was one of my favorite bands in my college days. Loud and fast, Motorhead was punk enough for me and metal enough for my metal-head friends so it was one of few places we found common musical ground. And, as a bonus, it scared away most people we didn't like. The faint of heart usually turn tail and run when Motorhead is played at adequate volume. 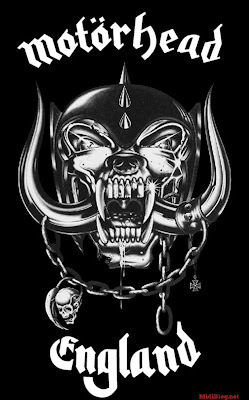 If you aren't familiar with Motorhead, dial up "The Ace of Spades" on itunes and you will see what I mean. 21 years later, I still had never seen them live until last night. It was absolutely the best rock and roll show I've seen in years. Get a ticket for admission on the floor for a Motorhead show and get within 50 feet of the stage. When Lemmy hits the stage, core strength training class begins and doesn't let up for about 2 hours (unless you need to get out of the scrum for a beer). Keep your arms up and your eyes open. Use your stomach muscles and uppper body to push anyone who bounces into you. Start every push with your stomach muscles and give it everything you have. After warming up for a song or two, take a few laps threw the pit of despair to add an aerobic workout. Keep your head up. Bounce off anyone who gets in your way. Pick up anyone who falls down to strengthen your lower back muscles (and because it keeps people from being trampled). Next August I think I will spend the month following Motorhead around whatever country they are in so that by cross season my stomach and back muscles will be in top shape. By cross season I should have abbs of steal and eardrums of mashed potatoes. But if Lemmy can do it constantly at 63 years of age, I can do it for a month. And remember, as always, that which does not kill you makes you stronger (how old was Neitche when he died?). I am no expert on these things, but I'm reasonably certain that Alex Jospe is a "she." And is the dude in the picture from Motorhead, or is that you? Seriously. On closer inspection, it appears that you are correct. Alex is a she. I had assumed that the stick figure drawings were more or less anatomically correct. I could edit the blog, but it's probably more likely to generate comments this way so I'll leave it as is. I hope Alex doesn't mind, whoever she is. Kilmister, and he plays rock and roll!! Seriously, you've gotta get on the slam dance program. You've still got a couple of weeks before Glouchester. Alex was selling cupcakes at Ice Weasels.